GSSSB BIN SACHIVALAY CLERK & OFFICE ASSISTANT EXAM SAMBHAVIT EXAM DATE DECLARED. 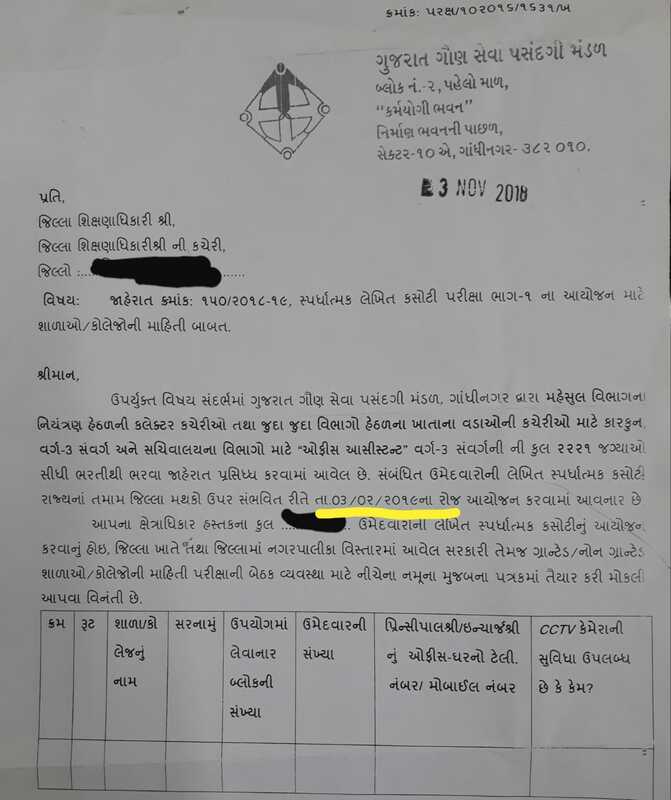 BREAKING NEWS:- GSSSB BIN SACHIVALAY CLERK & OFFICE ASSISTANT EXAM SAMBHAVIT EXAM DATE DECLARED. :-We Daily Update My Wesite All Education News,Education Paripatra,Bharti,CCC Exam Materials,School Paripatra,Current Affairs, Mission Vidhya, Ujavani Paripatra,Application, TET/TAT/HTAT Material,And Mp3 Gk. We Also Provide ShaalaKosh,New Scheme Paripatra, Exam Paripatra,CCC Exam News,Result Paripatra.ALL states latest current affairs, Daily GK Updates,Paripatra,Current Affairs,TET/TAT/HTAT Material,Bharti Paripatra,talati mock test, psi Current Affairs And mock test.bin sachivalay clerk mock test, GPSC Bharti, mock test, UPSC Bharti, Current Affairs mock test, Bank Bharti, Test Series, SBI Clerk,Mission Vidhya,police sub inspector mock test, UPSC mock test, IBPS PO Test Series.Old Paper Of All Previes Exam.We Provide police Recruitment Exams Study Material, Old Paper,exam timetable,Education Application, Exams answer key, provisional answer key, provisional merit list,Education News, final merit list and other information givin below address.